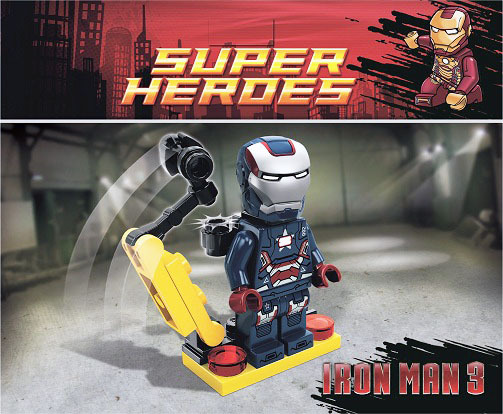 miniBIGS Minifig Blog: An Iron Patriot Minifigure is being released? Ok, what do you want first, the good news or the bad news? Welp, I'll start with the good news. LEGO is releasing an Iron Patriot Minifigure! And by the way, it looks great. Now the bad news. As of right now the only way to get it is by Pre-ordering The LEGO Marvel Super Heroes Video Game at Walmart. Yes, Walmart of all places, not Amazon, not Gamestop, not Best Buy. Walmart. I know some people do, but the vast majority of people who pre-order games do it elsewhere. And the game doesn't come out until October when the Iron-Man 3 movie is out right now, so the timing seems really off. None of it makes sense.